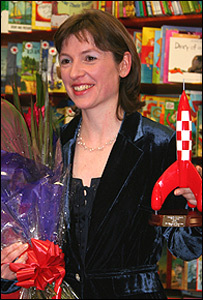 An Oxford author has won the top prize at a children's book awards. Julia Golding's debut novel - The Diamond of Drury Lane - was voted this year's winner of the Ottakar's Children's Book Prize. Set in Covent Garden in the 1790s, the book tells the story of an orphan who becomes involved in a diamond mystery. Ms Golding, who is married with three children, now works as a freelance writer after previously working as a diplomat and later for Oxfam. Ms Golding said: "It's a dream debut to win the Ottakar's Book Prize with my first novel - I feel like the chorus girl suddenly chosen as leading lady!" Winning the competition means she receives a cash prize of £1,000, and will be promoted throughout the company's bookstores. It is the second year that Ottakar's has organised the children's book prize.